When you set up parent and student logins, you can import email addresses that weren't already in your SIS, or you can import additional ones. Hover over the orange menu button and select either Import Parent Emails or Import Student Emails. 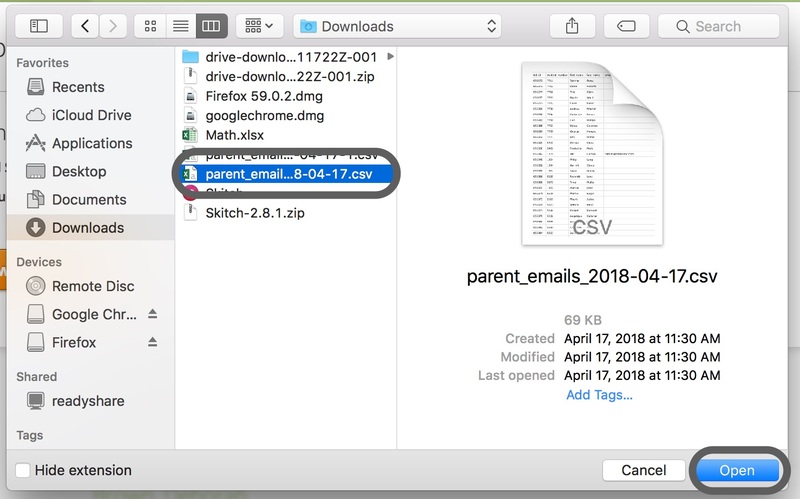 Before you can upload the student and parent emails, you must first download the CSV file to your computer. To do this, make sure that All Students is selected, and then click Download. Save the file to your computer. Now, return to MasteryConnect and click Choose File. Browse to the CSV file that you saved in the previous step. For the CSV to be submitted successfully, it needs to be formatted in the following way. Any additional email addresses for each student or parent can be added in a new column at the end of that row. After you find your CSV file, select it and then click Open. On the Import Student Emails dialog, click Upload.